While news of IT Raid at Shivkumar’s home is true, a fake video is viral claiming to be from his home. “The Income Tax Department’s search at Karnataka Energy minister DK Shivakumar’s Sadashivnagar residence in Bengaluru has yielded nothing. India today has accessed a copy of the Panchanama of the I-T department’s search conducted at Shivakumar’s residence. DK Shivkumar’s home with just one Locker room opened..Congis whr will u hide ur faces??? 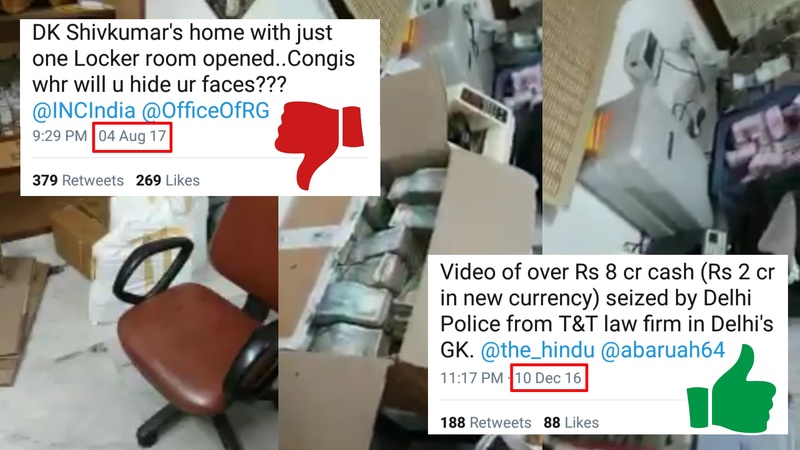 Video of over Rs 8 cr cash (Rs 2 cr in new currency) seized by Delhi Police from T&T law firm in Delhi’s GK. Cong leader from Karnataka D K.Shivkumar's house with just one Locker room opened! D. K. Shivkumar, karnataka Minister home raided, cash found…. ← Are you looking to get offended ? Here are your options.